The GLIDECAM X-10 will allow you to walk around freely and with speed while maintaining smooth pans and perfect stabilization. Glidecams are pretty smooth but the weight of the Glidecam with the camera and lens usually has people tired in about 5 minutes. 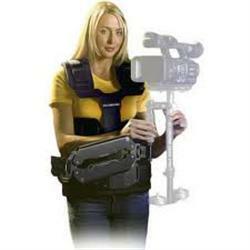 This stabilization vest with a high tech articulating arm will allow you to shoot as long as you can stay awake with minimal effort towards superb stabilization. You can run, walk up stairs, shoot from vehicles and climb a mountain while shooting with this on. This system is perfect for cameras weighing up to 6 pounds when used with the Glidecam 2000 Pro, or for cameras weighing from 4 to 10 pounds when used with the Glidecam 4000 Pro. The GLIDECAM X-10'S features a support arm that can be boomed up and down, as well as pivoted in and out, and side-to-side. It is the combined booming and pivoting action of the support arm that isolates your motions from the camera in a way that creates smooth camera footage.